Perhaps for one to find true happiness, he has to take a chance on himself. When I decided to take on the role as The Sports Corporation's director of communications two years ago, I was ready to conquer every single challenge put in front of me. I feel that I've done exactly that and because of that, effective July 1, I'm leaving the company. In my first year with TSC, I was excited and took on everything. Whatever was asked of me, I did it and more. As time went on, I realized that it wasn't what I truly wanted. I, for the most part, worked from a phone or computer in my office at home in Vancouver. The Sports Corporation's office is based in Edmonton. It really took a toll on me mentally. Nope, not for me. That's because I want to be around people. Ever since The Sports Corporation's summer development camp last July, I have been questioning my self worth and was never happy with myself. I was diagnosed with high bladder pressure last year, telling me if I didn't take care of it properly, there would be risk of my kidneys failing and that could be fatal. During that time, I tried a number of times to get clearance from doctors to attempt British Columbia's driving exam to try and earn a license so I didn't have to depend on cabs or carpooling with others. Three, four five, six doctors: still all the same answer. No clearance. Because of my hand and leg movements, if I got behind the wheel, I could not only seriously hurt or kill myself, I could do that to others. My self worth took another hit. Not only was I working a job that I genuinely felt I had reached the ceiling of and didn't foresee myself doing for the rest of my life, but the door on me driving house to house, rink to rink, office to office remained close. Was I going to just sit in front of computer, be doing to same thing and not go for what I really wanted, along with feeling sorry for myself? The answer was no. I knew I wanted to be in a communications department for an NHL team. I wanted to be back at a rink, being around the sport that I love so much. I was going to take the chance. It was scary, but I was going to do it. Scott Bonner, The Sports Corporation's senior vice president, knew I was feeling this way. We had a heart-to-heart conversation. I was going to leave. He allowed me to begin telling teams I was going to be available, despite not being officially done with the company until July 1. I was terrified, not only at the fact that I would be leaving the company and taking a chance with no guarantee a team will call, but also that the relationship between Bonner and me would be tarnished. Not just him, but the entire family. After all, I've known and worked alongside Bonner since I was 15 years of age. He, along with the-late Pat Quinn, opened doors for me that I never could have imagined would be possible. I've said this before and I'll say it again: Those two gave me purpose in life and there's nothing I could ever do that would repay them. I have been given reminders of why it was worth it to take a chance on myself. But perhaps none more special than the one that happened on June 7. Since I was eight-years-old, I've idolized Washington Capitals captain Alex Ovechkin and have had a deep love for the team. He was the reason I wanted to play in the NHL, at one time. He's the reason that despite not being able to play, I haven't quit on my NHL dream. Ovechkin's a phenomenal player and I always connected with his flamboyance and personality because it was extremely similar to mine. His sense of humour and flashiness is all me. The Capitals made it all the way to the Stanley Cup final and faced the Vegas Golden Knights. When they defeated the Knights 6-2 in Game 4 to go up 3-1, I booked my flight to Vegas to attend Game 5. There was no way I was going to miss the potential of witnessing live Ovechkin and the Capitals lift the Cup. In a blink of an eye, I was in Vegas and inside T-Mobile Arena. I was so excited. Not just because it was potentially the Stanley Cup-clinching game for the Capitals, but also because I was so happy to be back inside an NHL arena. I was in my blazer jacket, and that was pure hell considering how hot it was in the city, but, hey, that's my style . . . blazer jacket at all times. Anyway, I could feel the energy and I loved every moment of it. When it came down to the last second, with the Capitals leading 4-3 in the third period, I started crying. Actually, that might be an understatement. I started bawling. I didn't care if people saw. I don't think it was just because after 13 years of heartbreak for me, Ovechkin and the Capitals were finally about to win their first Stanley Cup championship. There was more to it. It was also because it was a reminder of what I wanted. It was a reminder that moments like this is what life is all about. It was a reminder that dreams are worth fighting for. I'm not a religious person, but it was like God and Quinn telling me that listening to my heart is going to be the right move, because soon I'm going to be on an NHL team and potentially have an opportunity to experience what Ovechkin and the Capitals did on the ice. I want this more than anybody. I watched the whole Stanley Cup presentation and saw on the emotion on the entire organization's face. Not only the players and management, but the guys who do ticket sales, marketing and communications. 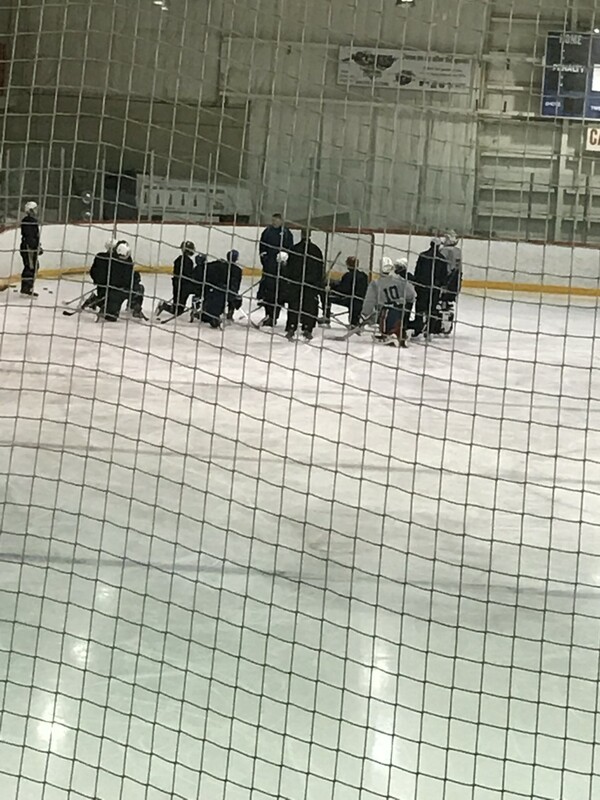 I couldn't help but imagine myself and the feeling to be a part of that as an team employee on the ice. I just sat in my seat for an hour after the game crying until the arena staff told me it was time to leave because they were closing down. I walked to back to the hotel, sat down in one of the restaurants and pulled my iPhone out of my pocket. “You know this, I'm saying it again, I love ya,” I wrote in a text message to Bonner. One of hardest realities for me to deal with is come July 1, as I said, I won't be working with him anymore. But everything that has happened has showed me that I'm worth taking a chance on. If I'm not willing to take a gamble on myself, then no one else will either. I was born with a cerebral palsy. I conquered that. People told me I could never get close to hockey or the NHL. I worked with the Giants for five years and served as the director of communications for The Sports Corporation, one of the most premier hockey agencies in the world, for another two. Doctors have told me my kidneys can fail if I don't take care of my health properly because of my high bladder pressure. I conquered that, too. I want to thank The Sports Corporation for the opportunity and understanding. It was an amazing two years and allowed me to grow into a better person and improve my craft. The two years have given me friends worth a lifetime. To president and chief executive officer Gerry Johannson, chief operating officer Steven Kotlowitz, vice president of hockey operations Manny Desousa, vice president of client services Rebeeca Radmanovich, vice president of fiance and administration Dale Bowes, along with the entire The Sports Corporation group, thank you all for everything. All the support and love was and is still greatly appreciated. I love you all. I'm grateful and honoured to be able to have been the company's director of communications. To all the clients and family members of The Sports Corporation, you all were a blast to deal with. I loved going to our development camps and connecting with you all. I will never forget those moments at the camps. Truth be told, they were the highlight. To TSC partner Kris Beech and AIM Mindfulness, thanks for being a friend and for all your support. It was great to learn about mediation and its benefits. Congratulations to your family on the birth of a baby girl! To the entire Bonner family — Scott, Craig, Terry, Pam, Gail, Nola, Hayley and Kennedy — I'm so proud to be part of the clan. You all are forever family and mean the absolutely world. I love you all. I have the best support group and hockey contacts anyone could ever ask for. I don't know what's next, but I'm excited to find out. July 1 marks NHL's free agency day. Well, I will be a free agent, too. Leaving The Sports Corporation was one of the hardest decisions I ever made. Am I taking a risk considering nobody could call? Darn right. But I know I have the ability and skill. I know that, given the chance, I can conquer anything. I believe in myself.